After a delightful afternoon hanging out with my dear colleague Andrej Zust on the last live Horn Hangout, we are now beginning rehearsals for our Berlin Philharmonic Easter Festival in Baden Baden. The whole orchestra will spend 3 weeks playing Othello, symphony concerts and lots of chamber music. Come and join us! Horn Hangouts USA What fabulous live Horn Hangouts they were! We streamed Jen Montone, Erik Ralske and Joe Alessi to thousands of viewers all over the world and had a fantastic time doing it. Thanks for all who joined in – both in person and online. You can now find the Hangouts on the Horn Hangout page. Enjoy! The first Horn Hangouts of 2019 are coming up soon! 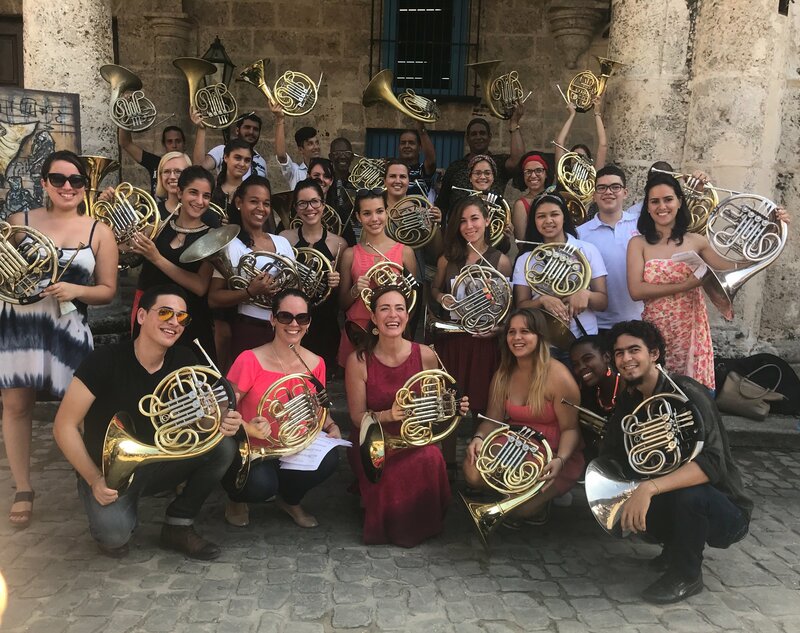 Team Horn Hangouts is going to the USA to hang out with three wonderful musicians- Jennifer Montone (principal horn, Philadelphia Orchestra) live from the Curtis Institute of Music. Erik Ralske (principal horn, Met Opera) live from the Juilliard School in New York and Joe Alessi (principal trombone NY Philharmonic) live from the NY Philharmonic Archives. If you have never joined in on a live Horn Hangout before, you really should, it´s a lot of fun, I promise! If you are regular viewers, I can´t wait to see you all live online in February – all details on the Live Page! It´s been a wonderfully busy year again and I wanted to thank you all for the fantastic support you have given me, the Horn Hangouts and Sarah´s Music. We´ve had some great Horn Hangouts this year and also many more fun Sarah´s Music episodes. We even won two big prizes – silver at the New York Festival Best TV and Film Awards and gold at the World Media Festival Award in Hamburg. Sarah’s Music is now officially award-winning…! And if you need any award-winning holiday viewing, please do catch up on the episodes you missed and let me know what you think – I suggest the the four episodes we filmed in Los Angeles this summer beginning at the Hollywood Bowl for starters. Some sad news is that we will not be filming any new Sarah’s Music episodes next year. Broadcasting budgets continue to be squeezed worldwide, including at Deutsche Welle, the host broadcaster of Sarah’s Music. My team and I have had an amazing run over the past four years and have made an incredible 96 episodes! I have loved and have poured my heart into making each and every one of them and feel so fortunate I have had this platform to share my music world. We’ve built quite a global community together! I promise the next project isn’t far away but until then, my thanks to my fantastic team and to everyone at Deutsche Welle for the past four years. 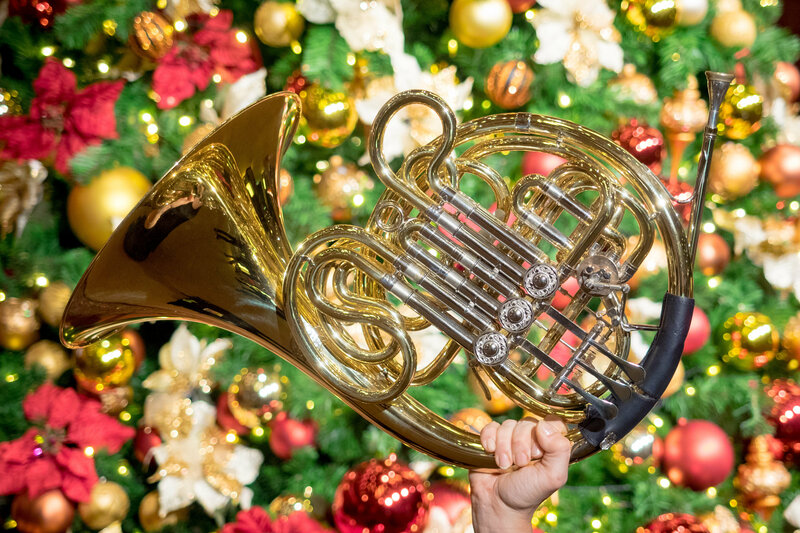 Coming up in early 2019, we have some Horn Hangouts planned – keep an eye out on the Horn Hangout page for the details. And I am looking forward to being back in Havana, Cuba this February with my beloved Havana Horns. Watch this space for more cool collaborations! I wish you a wonderful Christmas wherever you are in the world and a music-filled New Year! December 2018 Winter Drummerland! Last weekend I presented our annual Berlin Philharmonic Family Christmas concert. This year we featured the Berlin Philharmonic percussion section in a fantastic programme of body percussion and all sorts of other adventures. If you missed it live on the Digital Concert Hall, the concert will be up soon in the DCH archive – with an English voiceover! Watch this space, we’ll be Walking in a Winter Drummerland! November 2018 Trip to Asia with the Berlin Philharmonic. We are on tour in Thailand, Taiwan and China for the next 3 weeks, if you can´t be with us in person (do say hello at the stage door after) then join us via our Berlin Phil tour blog here. Don´t miss the live Parsifal on the Digital Concert Hall! This is going to be very special…Sir Simon, fabulous singers and I just love the way the Berlin Phil play Wagner! Join us live on the DCH on Sunday, April 8th. Hi from sunny Los Angeles! 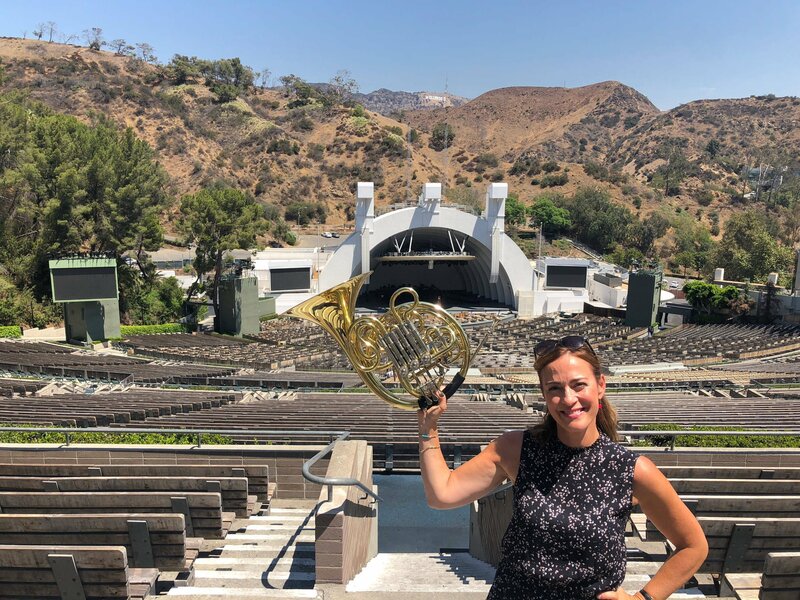 I´m so happy to be here – it´s a busy schedule with 2 weeks playing with the wonderful Los Angeles Philharmonic and also teaching at the Colburn School. We are holding two huge horn events – a horn concert on January 16 and a live streamed masterclass on the 17th, and also a Horn Hangout with trumpet legend Arturo Sandoval. Check out the Live page for details and see you either in person here in Downtown LA or online! Happy New Year everyone! Looking forward to the first Horn Hangouts of the year, live from Los Angeles! January 17th and 20th, check out the Live page here on the website for details! Horn Hangouts Guest List 2017/18 – Dear Horn Hangout friends, here, exclusively for you, is the guest list for the new season of Horn Hangouts! We have fabulous guests for you lined up, check out the Horn Hangout live page for more info and see you very soon online! The Lucerne Festival Orchestra The latest Sarah´s Music episode features the wonderful Lucerne Festival Orchestra – an elite orchestra filled with great people, I hope you will have as much fun watching it as I had filming it! Season 2017/18 at the Berlin Philharmonic! The new season at the Berlin Philharmonic is starting this week! It´s a back-to-school feeling after a wonderful summer, but a school that I really like to go to! We made you a little welcome-back video, have a look…Hope you can join us for lots of concerts either live here in Berlin or live on the Digital Concert Hall! Pacific Music Festival 2017 I loved being part of the 2017 Pacific Music Festival in Sapporo, Japan. It´s such an inspiring festival and it´s wonderful to work with so many talented musicians from all over the world. I made a Sarah´s Music episode about PMF two years ago – watch it to see what we do here – kimonos, tea ceremonies…and lots of fantastic music! And here is how we horns cooled down during the hot Sapporo summer: Frozen! We had so much fun! Thanks to the London Symphony Horns, the horns from the Band of the Coldstream Guards, all the other Household Division horns and everyone else who came down to the Barbican to join in. Was fantastic seeing you all and here is the video! If you are in Berlin on Sunday, May 14th, do join us, the Musicians4UnitedEurope, for a special fund-raising concert to show our support for the Pulse of Europe initiative. We are all passionately pro-Europe and are showing it the best way we know how – with music. Come and join us, all infos on our Facebook page. I loved the live Horn Hangout today with Radovan and Dinka Vlatković, hope you did too! It was fun to stream it on Facebook and see friend joining in from all over the world. If you missed it live, it´s here on the Horn Hangouts page, enjoy! April 9th, 2017 We were so happy that so many of you joined us and joined in at the annual Berlin Phil Live Lounge from Baden Baden. I really enjoyed hosting it and I´m sure you were agree, my guests were fabulous! If you missed it live, you can watch it here and our next live event will be the Horn Hangout with Radovan Vlatkovíc on April 24th, join us and join in! First live Horn Hangout on the new website! March 24th, 2017 – We streamed the first live Horn Hangout today on the new website with Tamás Velenczei as our guest and were so happy – firstly that Tamás was such a great guest but also that everything ran smoothly. Thanks to all of you who joined in – it was amazing to hear where you were all watching from – Australia, Afghanistan, China, Israel, South Africa, UK, USA to name a few. As always, the Hangout will up on the Horn Hangouts page as soon as possible so keep a look out for it. The next live Horn Hangout will be with Radovan Vlatkovic on April 24th. Join us! March 3rd, 2017 – welcome to my newly refurbished website! I hadn’t quite realised just how many Horn Hangouts and Sarah’s Music episodes there were to organise so it’s taken longer than I realised to get the new website up and running – but it’s been great fun to have the chance to revisit the wonderful times I’ve had. I hope you´ll have fun looking around the site, discovering new things and also rewatching some of your highlights. Do get in touch and let me know what you have found, what you enjoyed and what you would like to see here in the future. Some of the new posts you may want to check out include the Horn Hangout from Gebr. Alexanders about how to care for your horn, the latest Sarah´s Music Episode about Zohra, the Afghan Women´s Orchestra and don´t miss the Sesame Street Horn Challenge! Sign up to Sarah´s mailing list and we’ll keep you up to date with new events such as Horn Hangouts, masterclasses and performances.